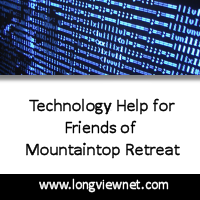 In partnership with Mountaintop Retreat, LongviewNET will donate 25% of the proceeds from new services provided to those visiting the Mountaintop Retreat website. In this way LongviewNET is helping sustain the ministry of Mountaintop Retreat. This is a limited time offering from LongviewNET. Please be sure to mention you saw this ad on Mountaintop Retreat’s website for us to be eligible for this donation partnership.